I stepped off the plane in Jamaica and was greeted by Oliver from the Jamaican Tourism Board who led me through immigration and customs in under 10 minutes total. I realize now what an amazing service this is as colleagues and other hotel guests told me about their two hour wait! There are a couple options for this service, but at $50-100 it is so worth it! My driver Goofy (yes that is his name) shuttled me and a couple other guests to Round Hill Villas. 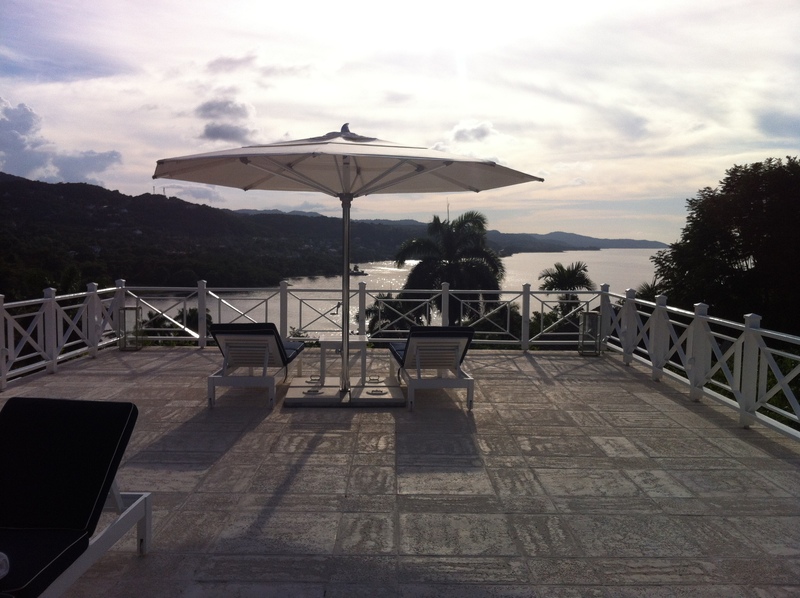 It is about a 25 minute drive from the airport, located in west of Montego Bay. Along the way you see vendors selling drinks in the middle of the street, people fishing, lots of chain restaurants like KFC & Pizza Hut, local jerk restaurants, a possible cruise ship docked, and of course beautiful views of the Caribbean Sea. Upon entering Round Hill’s private entrance, you drive up and around a curved hill that affords gorgeous sea views from the crest. As you drive down the hill to the main reception and lobby, there are roads off to each side leading to different villas. The open air lobby with a view straight to the beach, the complimentary rum punch, the easy check-in process, & the smiling staff are quite the welcome. Round Hill has a rather long history. It opened in 1953 and quickly became a destination for the rich and famous. Guests include Paul McCartney, Michael Douglas, Roger Moore and JFK and Jackie O. Kennedy to name a few. More recent years saw “Stella get her Groove Back” in villa 11 and star Taye Diggs was later married here. Many of the elite purchased villas here and are still owned today. When they are not in residence, the villas are rented to guests. 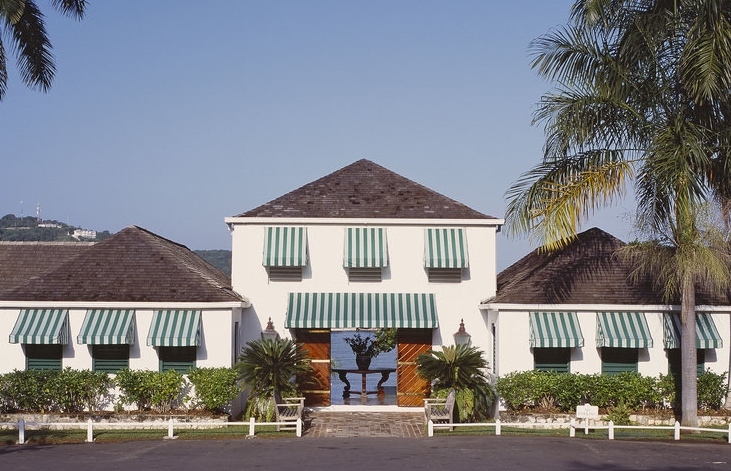 One such shareholder is Ralph Lauren who designed the Pineapple House rooms after a recent renovation. 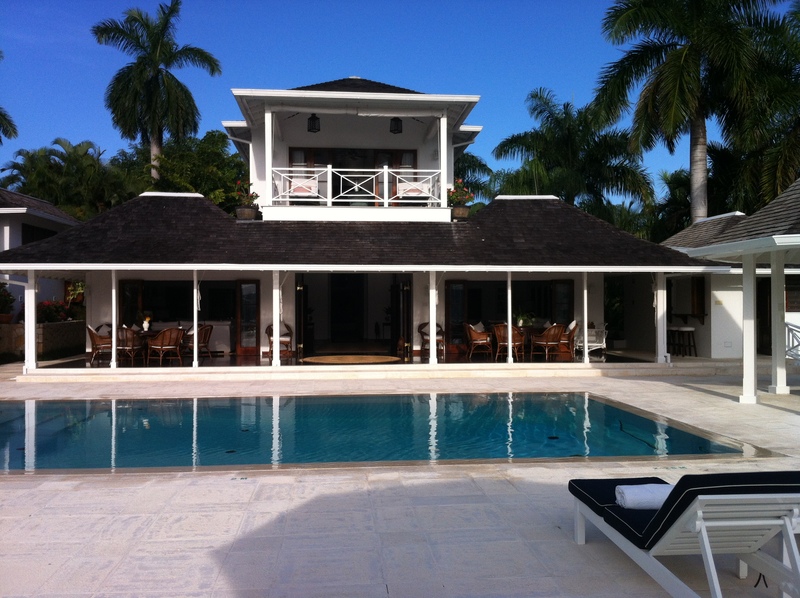 The villas are influenced by his design but are individually decorated by their owners. 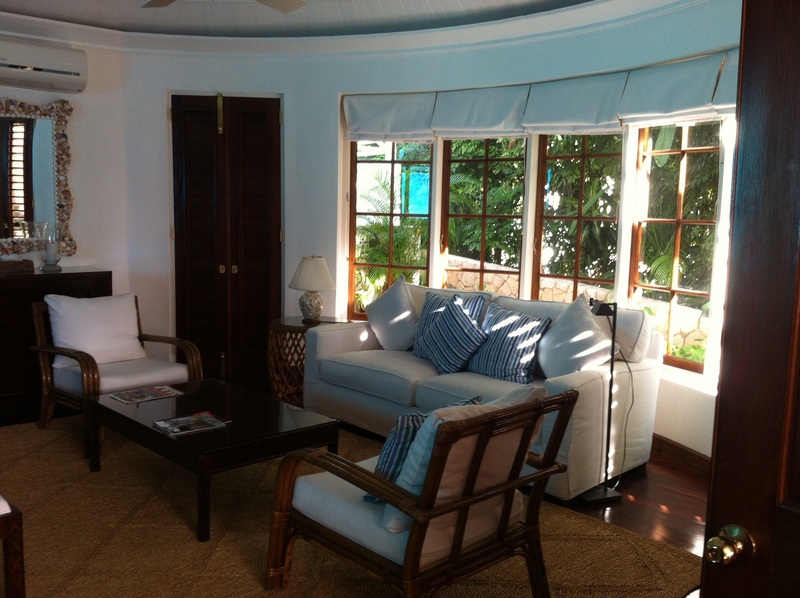 The style features lots of white with bamboo, wicker and mahogany furniture. After checking in, I went straight to the Seaside Terrace for lunch. The view was stunning and my food amazing. I ordered Jerk Pork Tacos with pineapple slaw and roasted corn. Other days for lunch we sat at the beach side bar. The food here was from the same kitchen, with a slightly abbreviated menu. It was a nice very casual place for lunch. For dinner, they have different locations and menus each night for variety. On Thursday and Sunday, dinner is served in The Grill with a farm-to-table menu. All of the ingredients are fresh and local, with many coming from Round Hill’s own organic garden. 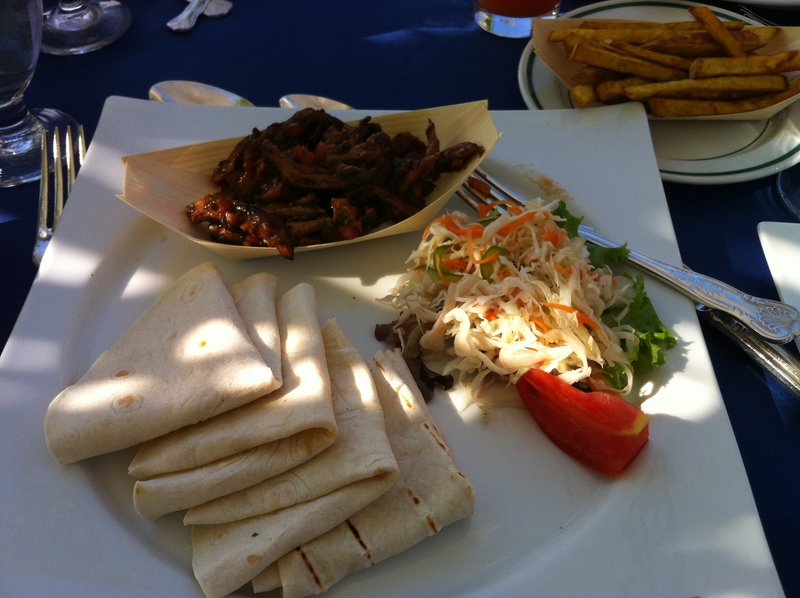 I enjoyed snapper in parchment with local vegetables such as callaloo, similar to spinach. The highlight of my meal was the smoked marlin yam balls for an appetizer. I was a little hesitant as they did not sound like much, but they were hands down the best thing I ate on the entire trip. I highly recommend these! On Friday night, we had the Jamaica Night buffet which highlights local specialties. The salad station was absolutely fantastic and I almost never made it to the hot foods! They featured conch, festival (similar to a hushpuppy but a little sweeter), oxtail, jerk chicken and pork, and vegetables. And don’t miss the dessert station with lots of pineapple and coconut. While talking about the dining choices, I can’t fail to mention that room service is available and if you are renting a villa, the staff can prepare meals in the villa. We had our made-to-order breakfast in the villa twice and it was lovely. Every afternoon at 4pm is tea with a variety of nibbles. And there is also the Polo Lounge cocktail bar where you can see old black and white photos of those past famous guests I mentioned. Round Hill offers several dining packages too. The accommodations closest to the beach is the 36 room Pineapple House. All of the rooms were designed by Ralph Lauren and face the ocean. The downstairs rooms feature small patios or balconies, where the upstairs rooms feature high ceilings and large shuttered windows that open wide for the view. 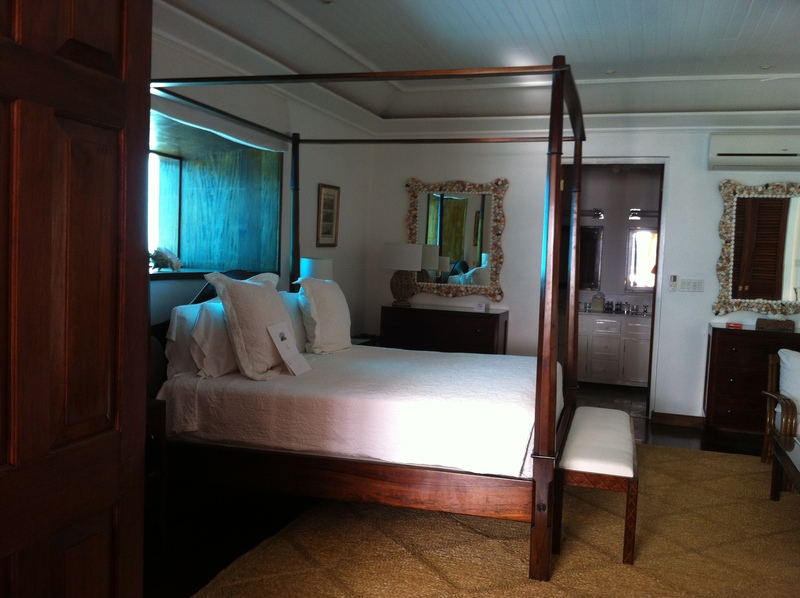 The rooms are clean with white stone and large mahogany four poster beds. 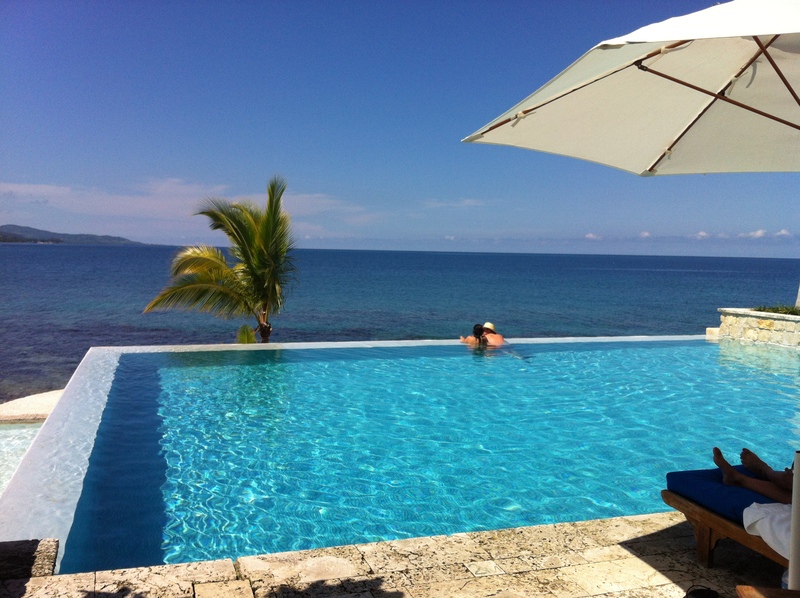 The rooms also overlook the resort’s infinity pool. 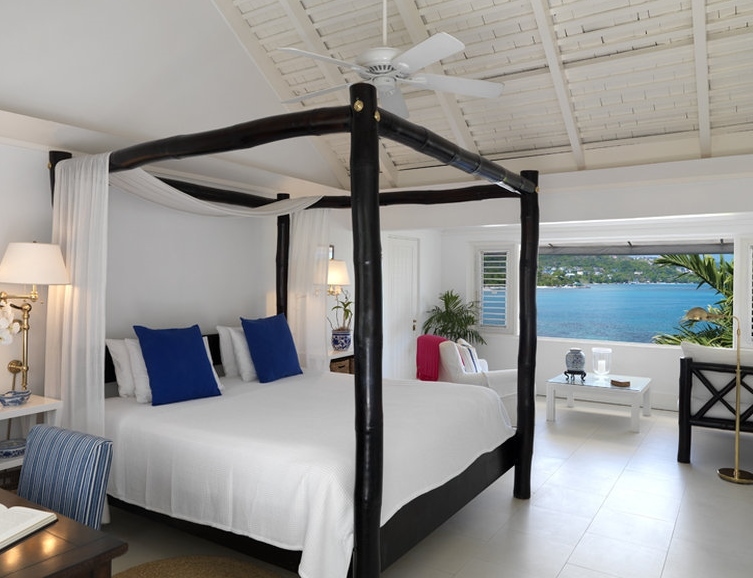 Nestled in the hillside, all facing west for fabulous sunset views, are 27 individually owned villas. Our villa #16 had 6 bedrooms each with their own living area and ensuite, a kitchen for staff use, and a pool with an expansive sun deck and dozens of seating options. Other villas have 2-6 bedrooms and all but 3 have pools. You may rent the entire villa or if you just want one or two rooms, the staff works to accommodate you in a villa with room separations for privacy. If you choose a villa room, you will not be booked right next to someone you don’t know. Our villa had a room upstairs, two below the pool and one off to the side for a separate villa feel so it could easily have been rented to separate couples or families. You would have only shared the pool area. My personal room was 73A, located on the bottom below the pool. This room is reached by a set of stairs near the kitchen and was my own little private haven. This room has a private patio, a sitting room/library and then a large king room with another sitting area. Next to the library is another living area with a pool table that separates my room from bedroom #73. This bedroom has two beds and would be a perfect accompaniment to my room for a small family of four. They would have total privacy from the rest of the villa. Both of these rooms have a very unique feature too. 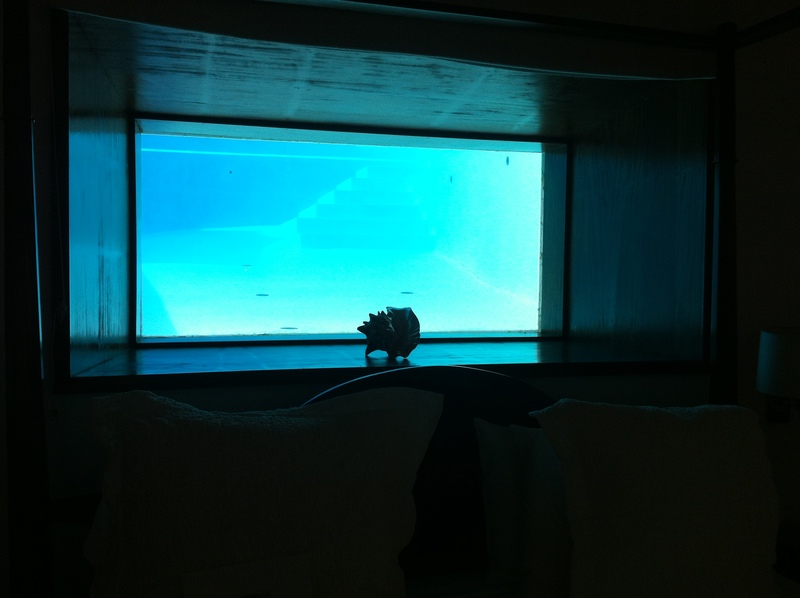 Above the bed is a window into the swimming pool! Round Hill is a leisure resort but still has plenty to do, or you can relax and do nothing at all. 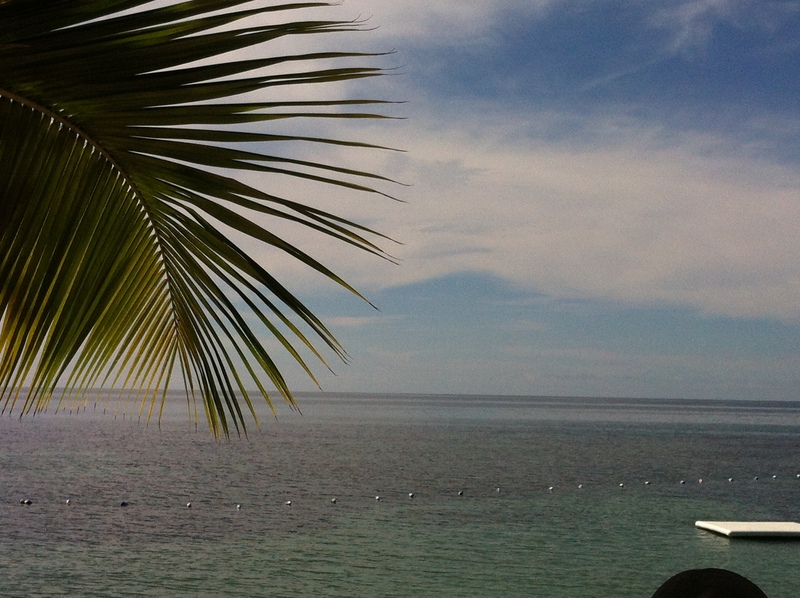 There are water sports such as kayaks, paddle board, glass bottom boats & snorkeling. They are currently renovating the spa and will also bring the treatments to your room. I had an in room massage- ask for Althea. And though I did not do it personally, my friends went to yoga and core classes with the amazing Donovan. He has been there over 20 years and he knows what he is doing. They loved him. There is also nightly entertainment near the restaurants. They also have the Pineapple Kid’s club daily from 9am to 5pm. 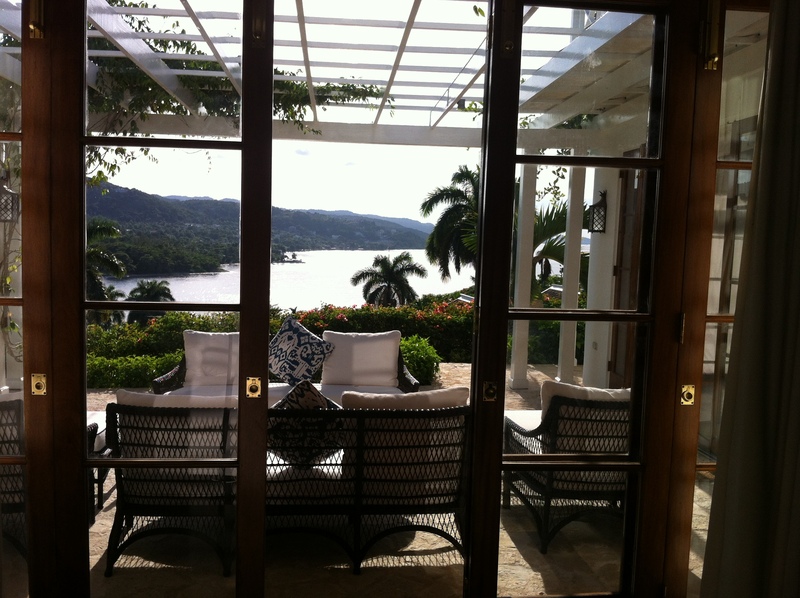 They have daily shuttles to Rose Hall for shopping and to the Tryall club for golf. And if you do want to leave the property and explore, you simply have to talk to the fabulous concierge Kingsley who has been with Round Hill for about 50 years (I forget the exact number but it was staggering!) You can not miss his smiling face and bright teal jacket. While on property I met one couple on their fourth visit and another couple who was visiting for the 14th time! After staying a couple days myself, I can certainly see why guests return again and again! 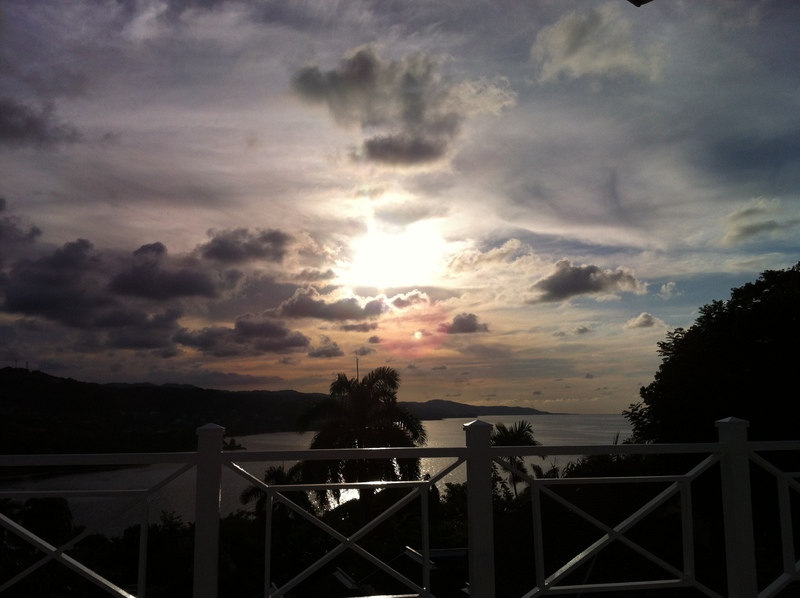 Until you can visit yourself, I will leave you with a gorgeous sunset view from our villa. Book your stay at Round Hill Villas through Kiel Travel and you will receive full daily breakfast for two , early check in and late checkout, and $100 food and beverage credit. Contact me at kieltravel@gmail.com.